In the past 6 months, more men than women have asked for a pay rise. What's the psychology behind women's reluctance to be paid what they're worth? Our Sheconomics view is that when women (employed or in business) set a true value on themselves the world will meet it. In the book we unravel the emotional barriers and self-limiting beliefs that might stand between you and your true value. Students are looking different lately. They’re not only getting younger (or is it me?) but at this time of year their usual youthful carefree smiles have been replaced by grimaces of worry. Stress. Terror even. They’re twisting their iPod wires like worry beads and chewing their nails more than gum it seems. Yes. The end of term exams are approaching and the pressure’s on. You can almost smell their fear (or at least I hope that’s what it is). Added to the academic pressure lots of them are going to leave Uni clutching not just a degree certificate but a whopping IOU as well. US research carried out last year showed that the students who’ll manage their debt the best aren’t the brightest ones. Or the ones who had good financial education. They’re the ones whose parents have tip-top financial habits. The authors of the study conclude: "Parents who intentionally teach their children about financial management may exert a greater influence on children's financial knowledge than do lessons learned in high school and those learned in the workplace combined. Given the importance of financial well-being to many indicators of college student success, such parental investment in the financial skills and knowledge of their adolescents may pay substantial dividends in terms of youth health, adjustment, and academic success." Some education, it seems, really does begin at home. A recent study showed that more women are highly satisfied with life in general than men. Modern life is complicated for everybody, but women tend to have better coping strategies than men. For example, women are more likely than men to go to their GP if life gets them down. They are also better at getting connected to people and seeking support from family and friends. Being more optimistic and less competitive, women are better able to restore themselves to a happy state. The study also showed that, of all the things in life that women would like to improve, a healthy level of savings, clearing debts and paying off the mortgage ranked highly. Men also placed importance on such financial improvements, indicating that both men and women want more control over their money and that today’s life aspirations focus on better financial planning and preparation for the future. The strong link between financial health and mental well-being revealed by the survey is really important. Our sense of well-being is closely tied to our financial stability and if this is threatened we suffer feelings of insecurity. Women rate their financial aspirations highly because being debt-free and financially stable makes them feel secure and more in control. The research was commissioned by first direct because, “As a bank that has customer satisfaction at its heart, we wanted to understand the level of satisfaction and happiness across the UK." Nice to know a bank cares about its customers' satisfaction. I had quite a reaction to my last post about why delaying gratification is the most important lesson to teach your kids. The whole issue of how we cultivate the right 'mini' money-mindsets definitely hit a rather frazzled financial nerve for lots of you. Don't forget there are lots of tips about this in Sheconomics. The chapter on Sharing Financial Intimacies is a life-line for every pestered parent. It deals with pocket money, how to give kids a sense of value, handing down good strategies but NOT your neuroses, the use of financial 'rewards' and saving. So, if you're a parent, do consult the book and start nurturing those young money minds today! I do also love the save-spend-share idea behind the moonjar - a three sectioned moneybox that teaches children that money isn't just for spending, it's for saving and sharing too! 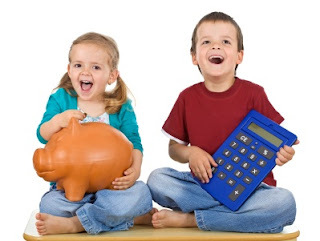 A lovely way to build your kids' financial literacy skills.